Let us try to define a rotation vector whose magnitude is the angle of the rotation, , and whose direction is the axis of the rotation, in the sense determined by the right-hand grip rule. Is this a good vector? The short answer is, no. The problem is that the addition of rotations is not commutative, whereas vector addition is commuative. 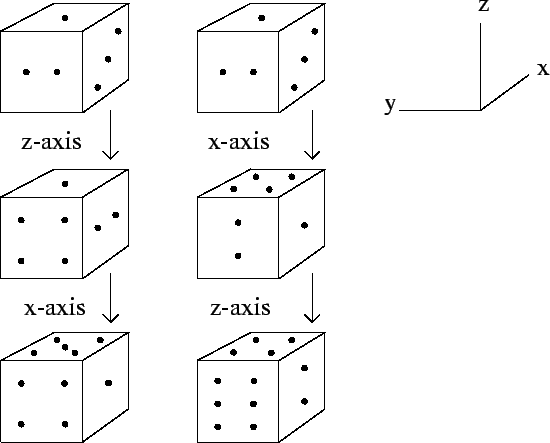 Figure 9 shows the effect of applying two successive rotations, one about -axis, and the other about the -axis, to a six-sided die. In the left-hand case, the -rotation is applied before the -rotation, and vice versa in the right-hand case. It can be seen that the die ends up in two completely different states. Clearly, the -rotation plus the -rotation does not equal the -rotation plus the -rotation. This non-commuting algebra cannot be represented by vectors. So, although rotations have a well-defined magnitude and direction, they are not vector quantities.